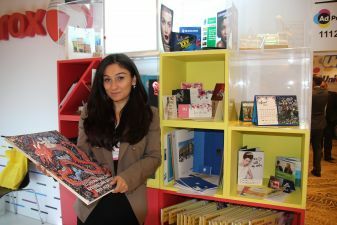 Print Art is a partner of the Xerox brand in Azerbaijan. Our centre consists of a team of talented and experienced professionals who create high quality products at optimal costs. The products that we offer are the most diverse ones and, most importantly, now we can print them with any size of edition. The Gift & Promo Fair 2018 presents a new technology for selective varnishing in small print runs, high-quality large-format printing on foil, as well as a new technology called "Svetozar", which represents small flashing power banks that serve for brand recognition. The latter became a kind of surprise on our part and aroused great interest of visitors. As the result of the first day at the exhibition, I can say that we are very satisfied with the flow of visitors and with the professional interest in our products. It was important to convey to our customers that we occupy a leading position in the market and offer competitive products that allow a potential customer to make the right choice in favour of high quality.